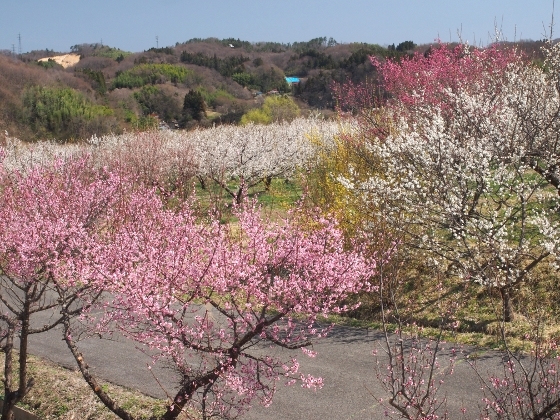 On this last day of March, ume blossoms at Umenosato, Koriyama have finally come to full bloom as shown above. 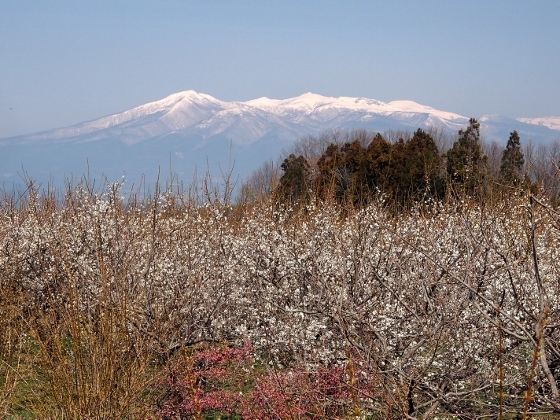 This is a vast ume farmland with about 10,000 ume trees planted for harvesting ume fruits. 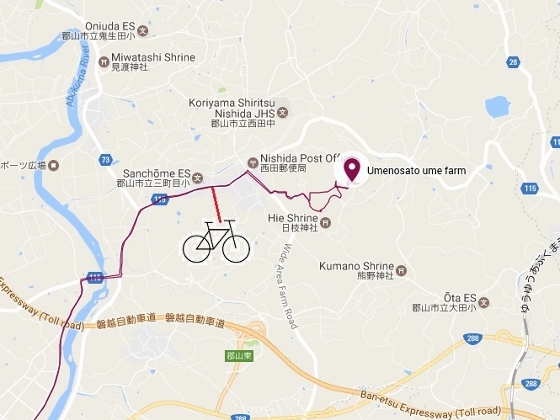 Umenosato is located on a hill about 310m above sea level. 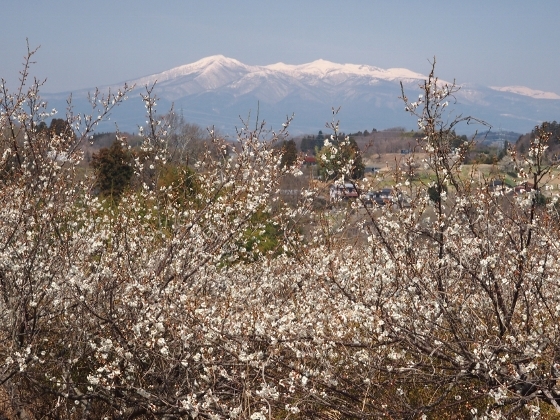 Today was a perfect clear day to watch ume blossoms with the background of snow-capped Mt. Adatara as shown above. Here is another view of Mt. Adatara with ume field in front. 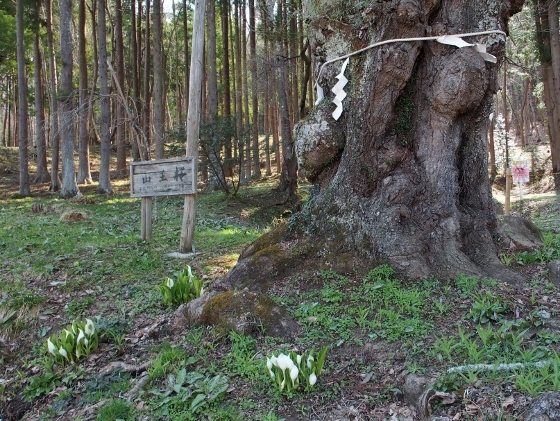 In the neighborhood, there was a sacred giant tree called Sanno cherry tree as shown above. Early spring flowers like skunk cabbage and dogtooth violet were in bloom on the ground. 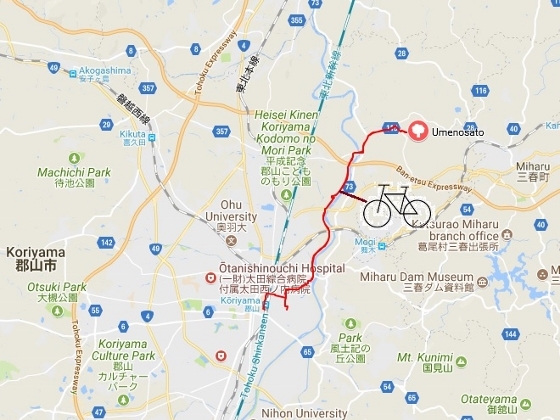 Umenosato is located within Koriyama City, but its nearest station is JR Miharu Station as a public transport. 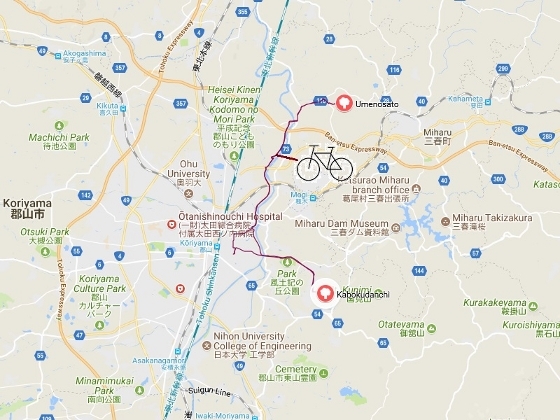 Please look at a map below for access information. 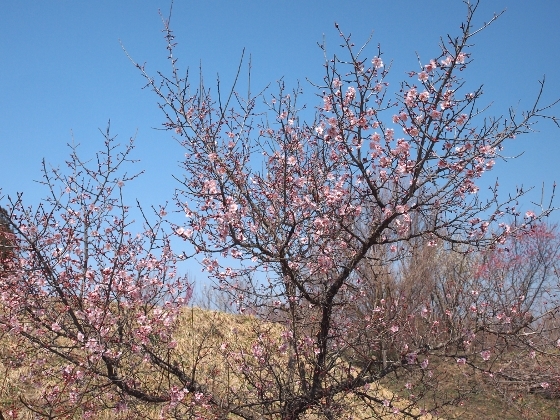 March is ume blossoms season in Fukushima. In this late March, ume blossoms started in some parts of Koriyama. 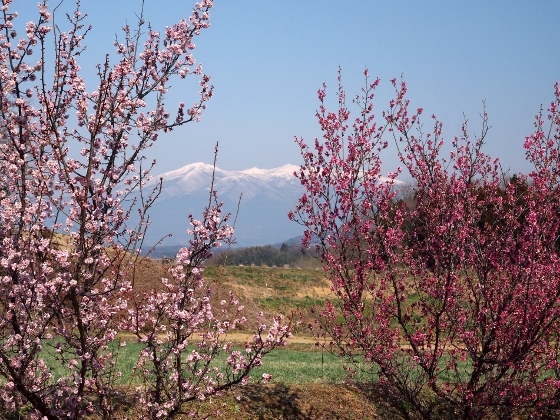 A photo above shows beautiful light pinkish ume flowers shining with the background of spring blue sky at Umenosato farmland. This is a vast ume tree field of more than 10,000 ume trees on a hill in the outskirt of Koriyama. 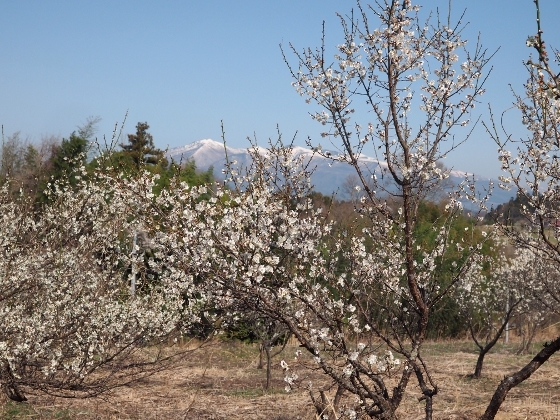 The field was developed for harvesting ume fruits for producing umeboshi or pickled ume. It was only 20-30% bloom today overall, and the full bloom is expected about a week away. 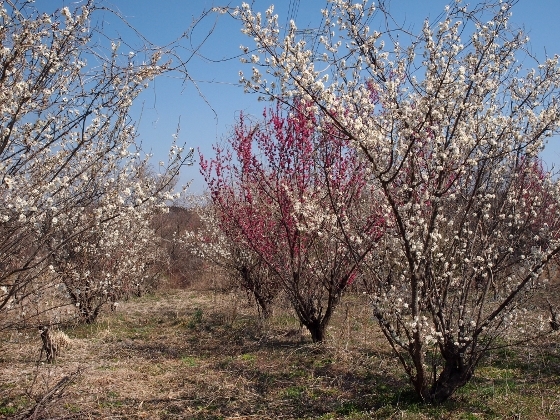 I found another ume blossoms field at Kabokudanchi site not far away from Umenosato as shown above. This was ume tree field for providing ume blossoms branches in the season. 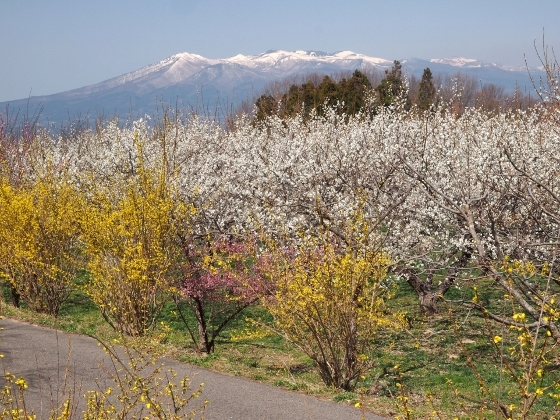 Kabokudanchi is more famous for its vast cherry tree fields. They become in full bloom altogether in mid-April. 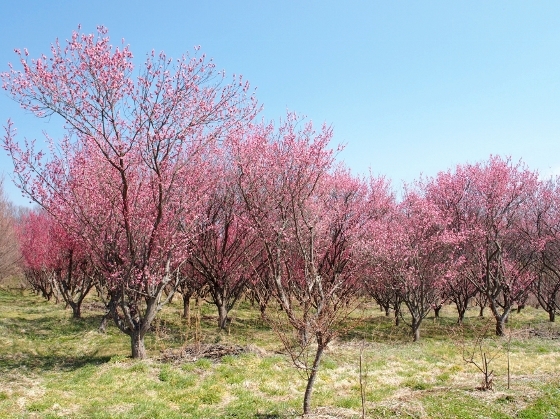 Ume blossoms at Umenosato Farm have finally come to their best time. Photo above is a view of snow-capped Adatara Mountains from Umenosato today. The bloom was two weeks later than the last year. Umenosato is a large ume farm with about 10,000 ume trees located in the northern Nishitamachi district of Koriyama City. The farm produces umeboshi or pickled ume, a traditional Japanese daily foodstuff. A family was having ume viewing picnic under a spring blue sky. Combination of white and red ume flowers shine beautifully under the sun. Thanks to a high pressure system over Fukushima today, there were no clouds on Adatara Mountains as shown above.